People have been making “space opera” trading games for 25 years. Among these is Ambrosia Software’s Escape Velocity, first developed in 1992. It is the best game of its kind. 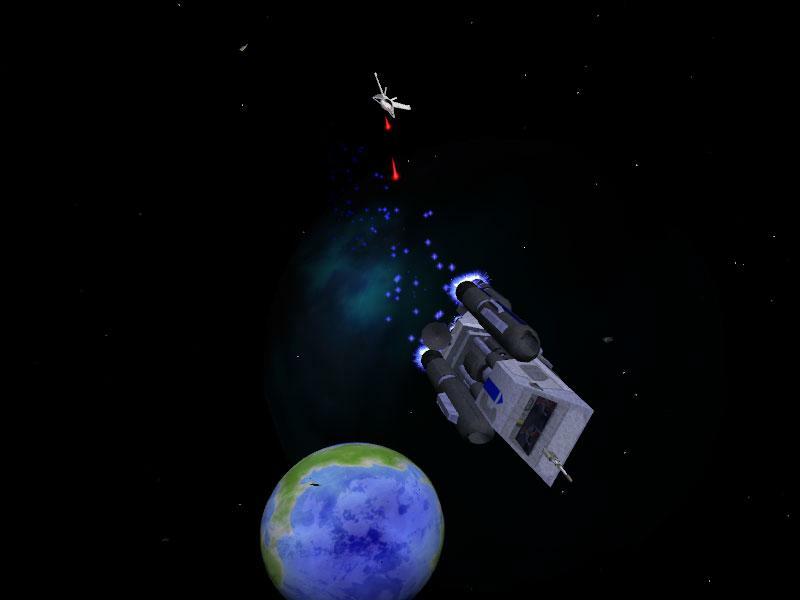 The most recent version, Escape Velocity Nova, is available for both Windows and Macintosh, and provides varying levels of challenge for the novice and for the experienced player. It is a classic, and everyone with a soul will enjoy it. I don’t want to discuss the geneology of space opera games in detail here; I’ve already done that in my review of Star Sonata, and if you’re interested you can read that article instead. The core thing to keep in mind is that there are tens of games that have essentially shared the same core gameplay (Elite, Galtrad, Privateer, EV), and most of them aren’t at all playable any more. I started thinking of EV when I recently learned about an open-source project to remake the classic Origin game Wing Commander: Privateer. It’s a cool project; like The Ur-Quan Masters project to revitalize Star Control, the Privateer Remake project lets you play this ancient game on your modern Windows, Mac, or Linux machine. The port is good enough that I was considering designating it a Playable Classic. After spending some time reviewing the genre, I’ve come to the conclusion that Escape Velocity deserves the nod, instead, for a few reasons. It was published by a small, independent publisher. I have a soft spot in my heart for Andrew Welch’s Ambrosia Software, ever since using his Easy Envelopes utility back in the early ‘90s. This little company has been putting out great, fun, innovative games every year. They are software heroes, and they deserve some recognition for it. Escape Velocity intelligently separates graphical glitz from gameplay. Privateer was, at the time, jaw-dropping. I remember seeing the Wing Commander games in the public computer cluster at CMU in 1991, and people would gather around to gape at it. That was 15 years ago. Today, they look primitive. Escape Velocity, on the other hand, is rendered in an isometric perspective where individual objects have a somewhat 3D look, but the gameplay itself is unapologetically 2D. EV today looks pretty much exactly like it did in 1992. And it still looks great. Escape Velocity uses an extremely extensible plugin architecture. This has a few nice side effects. First, it means that when you’re finished with the game, you can install user-written add-ons. More significantly, there are “total conversion” kits that allow you to purchase the most recent version (Escape Velocity Nova) and effectively play the first two games in the series, gratis. Here’s a brief walkthrough of the beginning of a typical game of Escape Velocity. You begin on your home planet with a little bit of money and a little shuttlecraft. Your shuttlecraft has a hyperdrive, some space for cargo, and a small gun that, on a good day, could be used to frighten very small children. This little ship is, theoretically, capable of going anywhere (as long as it can find a place to land and refuel) and doing anything. In practice, you’ll find it somewhat limiting. You can only carry so much cargo, mount so many weapons, and take so much damage. In order to upgrade your ship, you’ll need to make money. In the early stages of the game, you’ll make money by trading commodities, ferrying passengers from one star system to another, or by performing “special deliveries” of certain cargos to a certain star system within so many days. One of the exciting things about Escape Velocity, to my taste, is that there is an ongoing galactic conflict beyond what the player is involved in doing. Star systems may belong to a given political entity, which will enforce the local laws. If you want to be a simple merchant, plying heavily patrolled space lanes, you can do that. Occasionally, your defenseless ship might come under attack, and often you’ll see that system’s police force swoop in to save you. Eventually, though, you might feel brave enough to blow up a few pirates by yourself. And as you develop a reputation as someone that can defend themselves, an interesting thing happens: people will start approaching you in the spaceport bars, and offer you more interesting work than the standard missions. Often, this work will be on behalf of one of the various political factions in the game. Perform enough of these, and not only do you start visiting remote corners of the galaxy, but you start making friends – and enemies. Suddenly, the Galaxy gets a lot more complicated. There have been three major revisions of EV: the original (now called “Classic”), EV Override, and the current incarnation, EV Nova. For anyone who hasn’t played any of them, the differences aren’t truly significant: simply put, the three games have nearly identical game mechanics, but tell different stories. If you own the latest version, you can install plugins to play ports of the previous versions. But EV Nova has some improvements over the earlier games that make it worth trying first. Most significantly for new players it has an (optional) in-game tutorial, demonstrating some of the basic game concepts. Furthermore, there are quite a few “special” missions that are open to even new players, thus saving you from having to trudge back and forth across the galaxy hauling coal before you get to the interesting parts of the game. This works extremely well. I’ve been playing some version of Escape Velocity since it was released in 1992. At one point, I obtained a low-end Mac LC just so I could continue playing the game after I moved to a (mostly) PC environment. This many years later, it’s still fresh, it’s still fun, and it’s still memorable. It’s a great game, and deserves the name “Playable Classic.” If you try it, I’m sure you’ll think so, too. If you’re confused about what a “Playable Classic” is, this explanation might help. Once you agree with me that EV is the best game ever and purchase it, you can download the classic EV total conversion (for Windows or Mac), the EV Override total conversion (for Windows or Mac), or any of hundreds of others game mods. 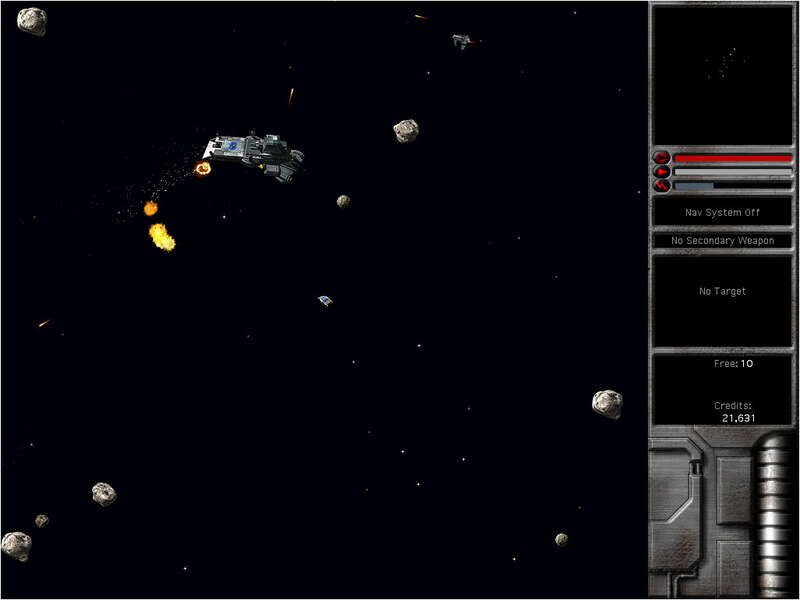 The Wing Commander: Privateer remake is available for free download, as well.